THE theme for NECF's 40-Day Fast & Pray event this year is "Thy Kingdom Come" - a fitting theme to follow through from last year's theme of "Hope of Jubilee". As we mark 50 years as the nation of Malaysia, as we pray for Jubilee blessings to unfold, as we move forward after the general elections - what next? We want to intercede for the fulfilment of God's sovereign plan for Malaysia and for His presence and transformative power in every sphere of influence in our country. As we pray for blessings on the nation and the righting of wrongs in society, we must also remember that all this is to happen according to God's Kingdom plan. His will be done on earth, as it is in Heaven. What is His '"Kingdom"? In the Book of Matthew where the phrase "thy kingdom come" is found, the writer alludes to the Gospel as the announcement by which the promised rule of God is revealed. This rule begins in the person and work of Jesus Christ. Every disciple of Christ is thus a witness to God's rule and participants in His reign. For believers, it means that we are to reflect and live out this good news, this Kingdom, to those around us. The prayer booklet is structured into parts over 40 days which explore the theme of God's Kingdom in relation to the individual, to the Family, Church, Community and finally, the Nation. 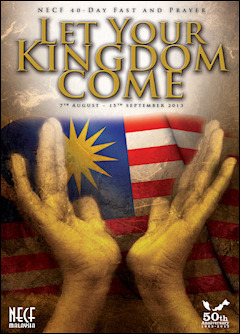 Order copies for your church now by calling NECF at 03-7727 8227, or downloading the order form 40-Days Prayer Booklet 2013 Order Form - English | Bahasa Malaysia.